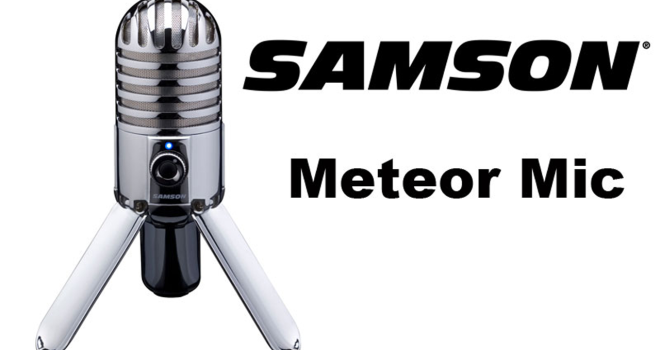 In a world full of Snowball and Blue Yeti microphones, how does the Samson Meteor Mic stack up against the competition? Pretty damn well. While the Meteor Mic is slightly more expensive than the Snowball microphones, it’s more affordable than the Yeti mics while still retaining roughly the same audio quality. The microphone sports a 25mm diaphragm condenser high-quality audio recording and a native 16-bit CD-quality 48KHz resolution. Altogether it’s a decent-sized mic that doesn’t look obstructive at all sitting on your desk at 6 x 3 x 5 inches and weighs in at around 1.6 pounds. To boot, the Meteor Mic has a sturdy build – it doesn’t feel fragile or flimsy in the slightest. If you break this thing, it’s completely your fault. As you can see in the video above, the Samson Meteor Mic has been carefully thought-out in it’s design. It’s been crafted to be a convenient-as-possible device for audio consumers. No disc or software is required to install it – just plug it in via a USB cord (one comes packaged with the mic) and in less than a minute the microphone will be installed and ready for instant use. The mute button and headphone volume dial are at an ideal size and perfectly positioned in the front of the microphone for quick and easy access. Rubber grips are on the bottom-backside of the stand legs to help keep the microphone from sliding around. But the most important aspect of a microphone is of course it’s audio quality. I can happily report that the audio quality is top-notch, especially considering the price you have to pay for the device. Whether it’s for commentaries, Skype calls, a podcast, or live-streams, this mic will more than get the job done. Regardless of the application it still retains is clarity. You can hear the quality of the mic for yourself by clicking on the audio clip below. Plain and simple: Buy this microphone. If you’re looking for an affordable mic that still offers great features and crystal clear quality than look no further than the Samson Meteor Mic. This reliable device will cost you a reasonable $60 depending on where you look. Best Buy chains carry them in-store for $59.99 (that’s where I bought mine) and you can also find them on Amazon for roughly the same price depending on who you buy it from. This microphone offers everything a gamer or amateur music artists could want in a simple affordable microphone. When it comes to the saying “bang-for-your-buck”, nothing fits that description better than the Samson Meteor Mic.